Front yards are being ripped up in a San Jose neighborhood, and while residents are well aware of who the culprits are, there's very little they can do. 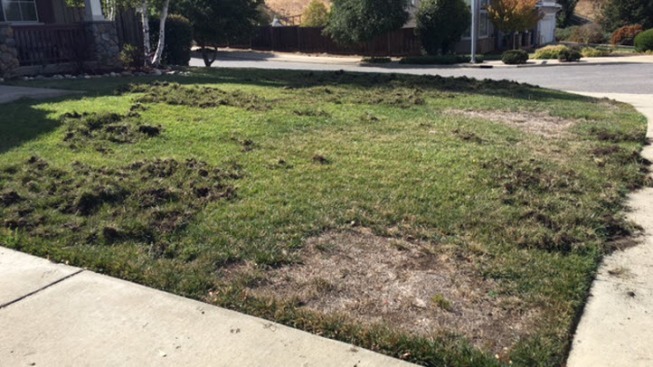 The torn-up lawns are the work of wild pigs on a feeding frenzy, residents said. They strike in the middle of the night, digging up lawns in the Evergreen neighborhood of South San Jose. "They came in and ... I saw a huge pack of them, and they were effectively ripping up the sod," resident Rod Murchison said. Murchison and his neighbors said there are about 20 of the wild boars, and they have destroyed more than half a dozen lawns in the neighborhood over the past week. Kevin McFatridge lives up the street from Murchison. His front lawn looks like a war zone. The pigs even took out his geranium plants. "We can handle a little patch here or there, but our entire lawn is now gone, and that's very frustrating," McFatridge said. Murchison believes the pigs came from the ranchland across the street from his home. He said he had a similar problem about 10 years ago but it stopped after neighbors got together to secure a fence. Murchison even put up a device that shines a red light, simulating a pig predator. He hopes it will be enough to keep the hungry grub hunters away. Murchison's 10-year-old daughter Katie built two fairy houses in the front yard. She's so worried about the pigs, she put up a warning. "I put up the sign so the fairies would know not to come at night because the pigs might come," Katie said.